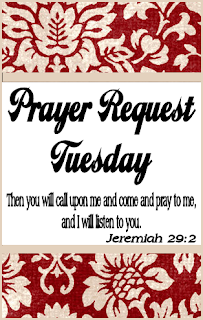 This is the day set aside for prayer for you. If you have a prayer request, please list it in the comments below. You don't have to give any information you don't feel comfortable with (a simple "unspoken" comment is sufficient). If you would like to pray, please pray for the comment above yours. Also, if you would like to share a "praise" for a blessing you have received, please feel free to list those also! I'd love to hear of it so I can rejoice with you.